There is some system to it all! Swiss German pronunciation does follow a few guidelines, and if you know about these guidelines, it gets a bit simpler to get a meaning out of all the ch-sounds! This is a rather unscientific overlook, based on my own experience and a couple of small books that I have. For some of the words I have also used phonetic writing, so that it (might) get easier to understand what the pronunciation should be like. It's probably an advantage to know a little German to benefit from all the things you find here, but by all means - I think most people will find a few useful tips or funny little curiosities! Well, transferring... Rules... Please don't understand this as if the standard German is the "original" and that the Swiss have developed their own kind of dialect from this. In fact, you'll often find the oldest ("most original", if you like) ways of speaking in Swiss German, whereas the standard German contains later developments of these. But to make it simpler I have used the standard German as a starting-point, and I'll show here how Swiss German differs from it. Second: these guidelines are no rules! Then they would have to be lots more precisely defined, and probably with lots of exceptions. This is more like a description of the most important tendencies. The ch-sound, like in ach, with the phonetic writing [x], is (of course) used in the same positions as it is used in standard German, e.g. in nach and Bach. Schlecht is pronounced "schlächt" - , ich is pronounced [i:x]. Klein is pronounced "chlii" - [xli:], Küche turns into "chuchi" - . Danke is pronounced "dankche" - , vielen Dank turns into "viledankch" - . -n in the end of words disappears. Because of this, some ns in the middle of words also disappear, when the word is composed out of two or more other words. Laufen becomes "laufe" - - and means "to walk" in Swiss German! Machen is pronounced "mache" - . Lebensgefährlich turns into "läbesgeföörlich" - . The Swiss are very fond of words ending with -li! Many words that neither end with -lein nor -chen in standard German, still get the -li-ending in Swiss German. Heftchen turns into "Heftli" - , and in this cathegory is also the famous kitchen cupboard: Küchenkasten (standard German Küchenschank) becomes "Chuchichäschtli" - . Diphtongs in standard German often turn into monophtongs (single vowels) in Swiss German. Haus turns into "Huus" - [hu:s], Schaum becomes "Schuum" - . -But this is not always the case: Saugut ("swine good") is pronounced "sauguet" - . Schweiz is pronounced "Schwiiz" - , Weisswein turns into "Wiiswii" - ['vi:svi:]. Leute is pronounced "Lüüt" - [ly:t], teuer is pronounced "tüür" - [ty:r], deutsch becomes "düütsch". At the same time some monophtongs in standard German become diphtongs in Swiss German. They start just like they use to the German way, but in the end they "slide out" into an e: u becomes ue, i becomes ie etc. Bier (pronounced with a long i in German) becomes , gut turns into "guet" - , Müsli becomes "Müesli" - . Fest becomes "Fäscht" - , Fenster becomes "Feischter" - , Wespe becomes "Wäschpi". Lesen turns into "läse" - , Türe becomes "Türä". That's why Säure is pronounced "Süüri" - , and Küche becomes "Chuchi" - . The ending -ung is "abbreviated" -ig: Richtung turns into "Richtig" - . Other endings can also be abbreviated into -ig: The little place Weisslingen, for instance, can be pronounced "Wislig". Lebensgefährlich > , besoffen > . In the Swiss German way of speaking, the first syllable of the word almost always has the stress, even when it is one of the many words from French. 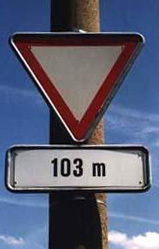 In the words merci, Trottoir (pavement), Büro, Balkon, Fondue, Kaffee, Dessert and Saison, there is a rather heavy stress at the first syllable, in contrast to standard German or French. To me, this is one of the things that give Swiss German its special "melody". Still, there are some exceptions. Words starting with mis-, be-, ent-, er- or ver-, for example, have their stress in the second syllable, like betoonä (betonen), entschuldigä (entschuldigen) and misraatä (missraten). Some long and/or compound words may have a double stress, like schtäi-alt (steinalt) or sigerette. A double stress like that can also be used to emphasize one of the words in a sentence. Swiss German has quite a lot of unaspirated sounds. Explanation in more normal words: When we say "t", we let a little air out of the mouth at the same time: - this is aspiration. In unaspirated sounds no air gets out. This makes the t almost sound like a d. In the same way it may be hard to hear the difference between p and b, because the p isn't aspired. "Zum Teil" in Swiss German can for instance sound like "Zum Deil". It's not always possible to understand everything. The reason is simply that Swiss German has quite an amount of words that you won't find (or at least they don't seem to be the same) in other languages. How would a poor Norwegian, for instance, be able to know that "Ankche" is butter (they can also say "Butter"), that "Kchile" is a church, "schaffe" means to work, "poschte" means to go shopping and "luege" means to look? The Swiss never use the past tense of the verb. If they want to talk about something that happened yesterday, they use the perfect tense. They would for instance not say "Yesterday I was at home", but "Yesterday I've been at home". "Gestern war ich zu Hause" is replaced by "Gestern bin ich zu Hause gewesen", standard German way of writing, or written in the Swiss German pronunciation: "Geschter bin i di Hei gsii". Some nouns have other grammatical genders in Swiss German than in standard German. Examples: German die Butter - Swiss German de Butter = masculine. German der Bleistift - Swiss German s Bleischtift = neuter. The verbs "kommen" and "gehen" are doubled when they are used together with other verbs. "I go shopping" is for instance "Ich gang go poschte" - in standard German this would be "Ich gehe gehen einkaufen". "I come to get" turns into "Ich chumm cho hole" - "Ich komme kommen holen". Another simplification (this is getting quite easy in the end, isn't it! ): You can hardly find the genitive in Swiss German. When expressing something about owning or property, vo is used (equivalent to the German von). D Chilene vo Züri ("Zürichs Kirchen" in German) - The churches of Zurich. If there's a preposition that in the standard German usually is followed by a genitive, they'll use the dative case instead: Trotz em Rägä ("In spite of the rain") instead of Trotz des Regens. The German s - - was abolished in Switzerland more than 60 years ago. Instead they write ss, which is much easier: The Swiss don't have to think of the rules of when to write the and when they can use the ss. Another easy way of writing they use in all occupations where both men and women might be involved: In all job advertisements in newspapers, for instance, they will be looking for a LehrerIn or KundenberaterIn, instead of Lehrer/Lehrerin or Kundenberater/Kundenberaterin. In Germany, however, I've been told that the people who use this way of writing are likely to be feminists..
Ein Amerikaner belehrt einen Schweizer: "Wir schreiben 'New York' und sagen 'Nüiork'." Meint der Schweizer: "Wir schreiben 'Wie bitte, was haben Sie gesagt?' und sagen 'Hä?'." Here is a try to explain some of the letters that are used in the phonetic writing on this page. The letters that I don't explain should be rather obvious to understand. - a "dark" a like in the English words "far" and "start"
- an e that you pronounce with a rather open mouth, like in German "wählen" or English "pen"
[o] - like in German "rot", quite much the same as English "more"
- the German ö-sound, like in "Rösti"
[u] - like in German "gut" or Norwegian "sol"
[y] - like the German ü in "für"
[ae] - often written "ei" in German. The diphtong similar to the one in "cry" or "mind"
[ao] - Mostly written "au" in German, like in "Haus"
[x] - like ch in "ach", "Nacht"
- "ng" like in "sing"
- like the English sh-sound in "ship"